Blue Suede News #99: Rick Extrin and the NIghtcats, Jimmy McCracklin, Bob Geddins, B.J. Thomas, Hank Snow, Larry Donn, Matt Lucas, Rockabilly, REAL Country Music, Blues, '50s Rock'n'Roll! Order our Latest Issue in PDF form (or any issue #60 - 108) by e-mail, only $4.00 anywhere in the world! Now Available on Amazon for the Kindle! 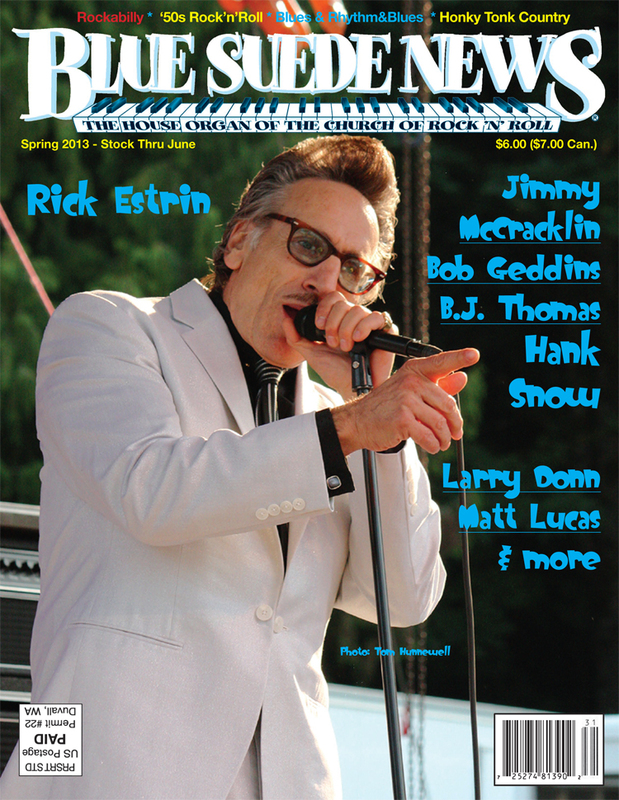 Blue Suede News #100 has a feature interview with consummate Blues songwriter and harmonica player Rick Estrin, who fronts the Nightcats - formerly known as Little Charlie & The Nightcats. There is also an extensive story on Blues Legend Jimmy McCracklin with a short piece on Bob Geddins, the Bay Area record producer who put out several of Jimmy's early discs. We have a piece on B.J. Thomas, whose new CD revisits several of his hits in new versions, and another on '60s rocker Matt Lucas. Country music pioneer Hank Snow is featured in a story centering on his guitar picking style and Rockabilly pioneer Larry Donn is also covered in the issue. Pictorials show a couple of Northwest rocker reunion shows including Don Wilson of the Ventures 80th birthday celebration; a Rockabilly festival at Pullman City Western Town in Germany; and several shows in the Seattle area. As always there are regular features Tidbit Jukebox and Original Versions plus our extensive reviews section - 4 more pages of reviews in the digital editions! Overseas customers can get multiple Blue Suede News issues (6 to 10 issues depending on number of pages per issue - please e-mail for more information!) in a flat rate Priority envelope (to the U.S.) for currently $14! Inquire for Priority Mail rates outside the U.S.
Order Below PDF version available! only $4.00 anywhere in the world! Send $6.00 (U.S. or Canada), or $8.50 (Outside the U.S. and Canada) and note which issue you're buying - to Blue Suede News, Box 25, Duvall, WA 98019-0025 U.S.A.
Order our Latest Issue in PDF form (or any issue #69 - 100) by e-mail, only $4.00 anywhere in the world!